Kings Island 2009 Work Started? Care to Rock the Vote? Today the LA Times' Funland Blog takes a look at why California roller coasters rank so low in various online polls. It's a fun question to ponder. California has a ton of coasters, yet none seem to ever break into the top of the polls - or even close, really. There's tons of Californian industry website coverage online, plenty of parks, lots of coasters, and a dense population with lots of fans - but why don't the rankings reflect all this? © Pittsburgh Post Gazette / Yellow Submarine Marketing Comm. The Pittsburgh Post Gazette ran an interesting article yesterday about the ad agency side of the amusement park business. They focus mainly on the Yellow Submarine Marketing Communications company, which produces many of the ads for Cedar Fair parks. The article mentions that the company has a $30 million or so account for marketing with the park operator spends each year. The article also features some comments from Kennywood regarding their ad tactics. It's really a pretty interesting article. Click here to have a read. KTAR is reporting that plans are being formed for another theme park in Arizona, this one to be named Coyote Canyon Theme Park. 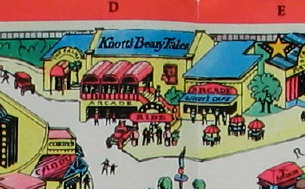 This comes in addition to the planned Decades theme park that's slowly crawling into existence as well. The $600 million Coyote Canyon park would be western themed and have plenty of thrill rides, 300 ft. and 250 ft. drops on coasters are already being mentioned in the article. The park hopes to start building this fall and open in 2010. I hope this park, and Decades for that matter do open, but I'm still not holding my breath. I would imagine it would be hard to get one park open in the state, let alone two. If I'm wrong though, how awesome would that be for those living in Arizona? And that image at the top is the Arizona state flag, cause I couldn't find anything else interesting to use. Ha. 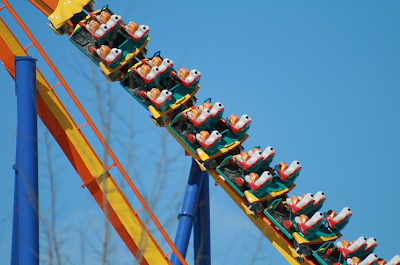 User DerekRx on the ThemeParkReview boards took some photos of Fahrenheit at Hershey Park this weekend and posted them. The ride looks like it's only got half the cobra roll left to go before it's complete. That Norwegian Loop in insane. Can you imagine the hang time when you're at the top of it! Click here to see all of DerekRx's photos. That stinks, eh? How long till we can do this with Geauga Lake? 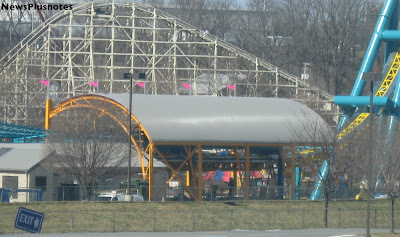 RollerCoasterPro has a new update featuring current photos of what's going on at Six Flags Discovery Kingdom, which has been open for 2008 for a few weeks now. Tony Hawk's Big Spin isn't really even under construction at this point, I guess it's still being shipped from Europe. But there's plenty of other stuff that's new or changed for 2008 that makes the photos worth checking out. With major construction done on Voodoo, I waited a bit longer to snap some photos of what's happening at the ride site. These photos are from today, March 29th. A close up of the station and launch track area. Those fake metal flags that went up on the front of the station are now pink! A very bright pink... Also looks like the covers for the launch track have been painted to match the ride supports. General view of the whole ride, taking advantage of the early spring blue sky. Another view of the station. It looks like the front of the station was also finished being painted orange. Still no sign of the train on the track that I could see, unless it's behind the electrical room. A nice view of those pink flags. Yes, I copied the same pink color of the flags for the NewsPlusNotes logo in this one. 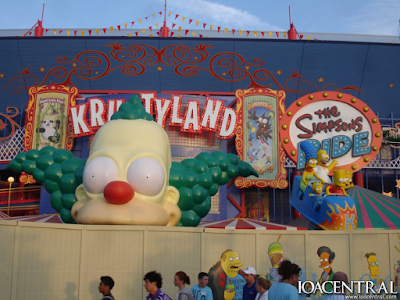 Time to take another look over at IOA Central's continuous updates for The Simpsons Ride. I can't believe how much they've 'plussed' the former Back to the Future building and totally changed it's looks. Really they've just added new paint and lots of decorations, but the overall change is quite dramatic. IOA Central has some photos of the ride at night, too, which looks very nice also. The 2007 Annual Report for Cedar Fair Entertainment Company is now available for download from their official website. I like the design this year, I much prefer it over last year's report. Back on track, the report does feature all the parks and other stuff Cedar Fair has to do with, like licensed properties. They even have a little blurb about the Hanna Barbara characters so I guess they're not ditching them too soon. 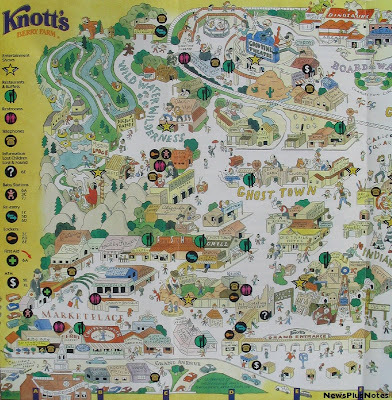 Here's a Knott's Berry Farm map that was sent to me in 1997. This is pretty much how the park was before Cedar Fair started making changes. It was really big so I cut it in half - the images are still really large files. Wildjammer was new that year, you can see it on the map in the upper right corner. Look at how big Reflection Lake still was! Silverwood Theme Park has announced the new name for their new roller coaster for the 2008 season: Aftershock. Cool name, much better than many that are being used today (Flight Deck, ha). 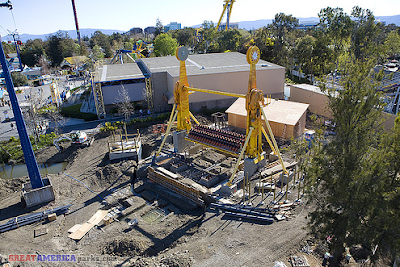 Silverwood just put up some official construction photos on their website if you'd like to check them out. Roller Coaster Alley, an unofficial Silverwood website, also has some information on the winner of the contest that was held to choose the name for the ride, which as a reminder is coming from Six Flags Great America where it was Deja Vu. I wonder if the ride will be painted for its new home at Silverwood? The Funland Blog from the L.A. Times has been able to confirm that It's A Small World at Disneyland will be adding popular Disney characters to the attraction when it reopens later this year. The addition of the characters has sparked some serious anger and debate among Disneyland fans. TMZ, of all places, recently had a poll where something like 90% of voters were against the addition of the newer characters. Personally, I'm not sure I mind the addition. I'm not a Disney purist, though, but I do believe that if Walt were alive he'd be open to these types of changes. I doubt he'd ever want his park to be a museum. And, that picture up top is one I took of the attraction at Disney World, not Disneyland. Gilroy Dispatch is reporting that Gilroy Gardens Theme Park, managed by Cedar Fair, has lost two of it's long time board members. The President of the board and park founder Michael Bonfante have both resigned for personal reasons, and what sounds like on good terms. The park was the dream of Michael Bonfante, and now he says he's moving on to work on his other dreams. 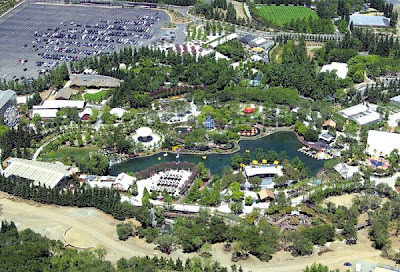 Gilroy Gardens was recently purchased by the city of Gilroy for $13.2 million. 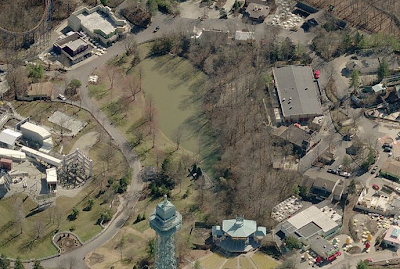 Sure, this isn't really the biggest news, but I really liked the photo of the park from the air! Check out the "107 ft. Inverted Loop with Dive In!" It looks rounder to me than the one on Speed Monster at TusenFryd. But maybe it's just me? I can't wait to check this ride out this summer. I'll have to go early though to avoid Fahrenheit's nine hour long line. Haha, just kidding. No I'm not. Thanks to a reader for making me aware of this - it looks like Kings Island has already started work for their rumored 2009 B&M hyper coaster. As seen in the photos in this gallery, it looks like a lot of land moving type work has already started in the area of the pond in the above aerial photo. The pictures aren't super quality, but you can make out plenty of land markers that give away the location of the work. For instance, in one pic you can see that it was taken from the seats of the outdoor arena in the very bottom of the above aerial - also the Ital...err the Backlot Stunt Coaster is visible in one pic as well. I'm no construction expert, but to me it looks like they are removing the pond from existence. The land looks like it's being flattened out, and in one shot you can see that there are parts for underground water/sewage lines - those big concrete things they put under there - laying around the site. I don't know if this pond was man-made or not, but if it was fed by a stream or something that network of underground piping would take care of that. That's what they did with the small stream that ran through Dorney's lower section back in 2000. Once they would have this land flattened and ready to go - it'd certainly make a perfect location for a coaster station, queue, etc. I'm sure there will be plenty to see in this area of the park all summer long. Wild West World, the failed theme park in Kansas, has been purchased with the intent to reopen the property later this year. As Kansas.com is reporting, Murphy Brothers Exposition has singed a $2 million contract to purchase the park. The company operates several carnival rides at fairs held around the state. The purchase cost, along with $4.2 million to get the rides back open, will be financed through state industrial bonds. The sale closes the end of May, other potential buyers have until May 8th to make a better offer. You can now download Geauga Lake's Wildwater Kingdom's 2008 brochure from the park's official website. It's a rather plain brochure. Speaking of their official website, it's suddenly now changed to wildwaterfun.com. I actually give them props for removing Geauga Lake from the web address. Now just get ride of it from the park's name and I'll be even happier. Outside The Berm recently posted an amazing article on a classic dark ride with plenty of information I've never seen before. Knott's Bear-y Tales (1975) was the dark ride that was changed into Kingdom of the Dinosaurs (1987) before closing for good a few years ago at Knott's Berry Farm. Any fan of dark rides or Knott's should really check this article out! Coaster Dimension has a new photo update from Disney's California Adventure. 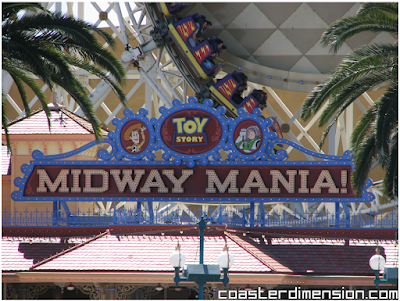 The photo above clears up the debate about whether or not California's Midway Mania would be called ... well Midway Mania. Press for the rides in both Florida and California have called the ride Toy Story Mania thus far, but it was rumored that only the California version would stick to the Toy Story Midway Mania name. It's a small difference but it makes sense because California's version is located on a boardwalk, so the Midway aspect works. I mean there's even midway games next to the ride! It's small steps like this that will help bring a coherent theme back to California Adventure. 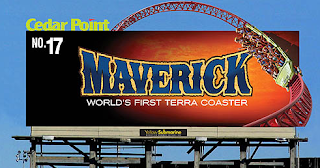 Click here to check out Coaster Dimension's update. It's that time of year... lots of photo reports of new rides and attractions to look at! Dollywood opened recently as well and had their new attraction River Battle ready to go. Here's a ton of photos of the new wet ride from Theme Park Review. The ride looks great, the theming is quite cute. The photos are really great quality as well, so props go out to both the photographer and Dollywood. It looks like Kings Dominion had a really beautiful day to start their 2008 season. 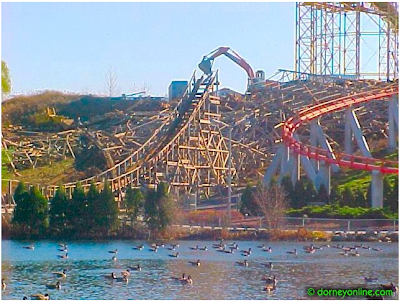 Over on KD Connection there are two photo reports from the park's opening day, with more Dominator photos than you can shake a stick at. I love that expression. Kings Dominion has new signs and stuff all over the place. They really did totally phase out the Paramount stuff for this season. It all looks pretty good though, except that Drop Tower sign which just looks cheap to me. It was rumored that the Italian Job rides would have their cars changed, but they look the exact same to me. And so long as they plant grass under Dominator it'll look really great! 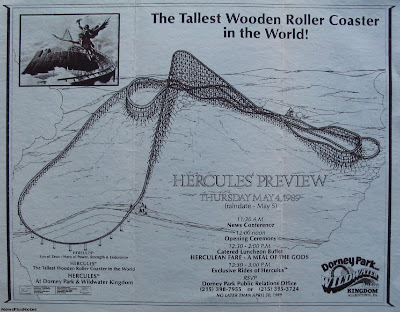 It would be hard to argue against the massive impact that Hercules had on the development and future of Dorney Park when it opened on May 4th, 1989. 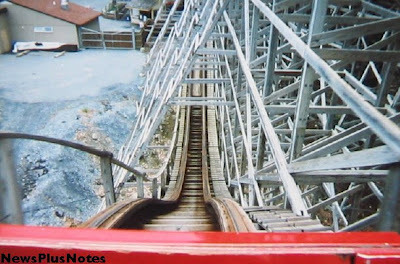 It was big, fast, intense, and a gave a wild ride that was hard to find on other coasters of the era. Now only a piece of Dorney Park history, I wanted to try to slap together some details of the attraction's past to bring the ride's memory full circle. That said, here we go. As with so many Dorney Park attractions, Hercules did not follow the typical amusement park ride building pattern: Announce, Build, Open. Hercules had drama, the type of drama that almost didn't allow the ride to be built. 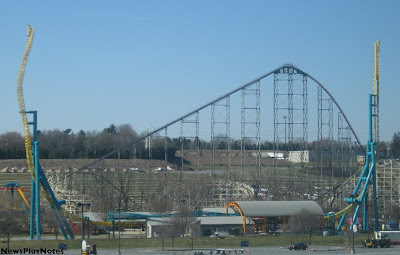 Dorney Park hired Curtis Summers to design the coaster, and hired Charles Dinn and his crew to build the massive ride in late '87 or early '88. The coaster was laid out over an empty hill at the edge of the park's property, and was to be the anchor of the new park area that replaced the former speedway which ran at the park for many years. 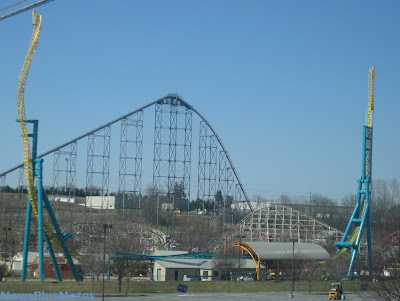 Building such a massive ride was a huge project for Dorney Park. The six million dollar attraction had several names considered, such as Thunderhawk and Barbarian, but in the end Hercules was the winner. A ride so big also needed a huge announcement, which takes us back to the middle of July, 1988, when the park sent out a press release touting an announcement to be made on the 15th of that month. "The purpose of the news conference is to formally unveil plans for a major attraction set for Dorney Park for its 1989 season. The attraction promises to be Dorney's greatest achievement, setting it apart from the remaining amusement world." Although the name for the ride was not announced at the press conference, Harris Weinstein did present a group of press and coaster buffs with a drawing and some statistics at the conference on the 15th. The ride was to be gigantic, and the crowd was excited. Here's where the 'typical' Dorney Park ride approval stuff started; only a few days after the announcement the South Whitehall Township started listing aspects of the coaster they were bothered by - it's height, location in a flood plain, how close it was to the park's electric substation. Curtis Summers actually came to one of the planning meetings to assure the ride would be safe and provide additional information on the supports that would be in the park's lower lake. Other issues were also addressed, and something must have pleased the zoning board because zoning approval was given to the ride. The planning commission gave a conditional approval for the ride at the end of July 1988, but wanted to see what their engineer had to say about the plans before making it final. The last piece of the approval puzzle would come from the Board of Commissioners, but the park missed their monthly August meeting, and at the September meeting Weinstein started the fireworks. The commissioner meeting was filled with raging debate over the ride's footings in a flood plain, and how high it should be over the lake. It looked like the commissioners wanted to delay their decision another week, so Harris Weinstein announced that he would have to abort plans for the ride if the park did not get approval right then and there. He said they needed to get started on the ride to get it open for the 1989 season, and that the designer and builder had other projects scheduled that would conflict with the Dorney project should it be delayed too long. At the next meeting, in the middle of September, the commissioners forced the park to agree to a resolution that the ride would not generate noise above 85 decibels, an agreement that appeared to finally clear the way for the park to begin work on the ride. Another week went by, and suddenly the commissioners decided to appeal the approval given for the ride by the zoning board, almost two months earlier. This was both a surprise to the park as well as a slap in the face. The appeal allowed the township to file a court order for the park to stop work on the ride, however, not much was really going on at the site at that point. Dorney Park officials said that if the commissioners went forward with their appeal they would be met with a "multimillion dollar lawsuit" from the park. The lawsuit wasn't filed, but the park and the commissioners did have their day in court. In the middle of October both parties met in the Lehigh County Court to discuss the matter. Finally, an agreement was made: both the park and the township would hire a sound expert to decide what would be an acceptable amount of noise for the ride to make. If, when the ride opened, the Township felt it was going above the 85 decibel limit, they would be able to go back to court to argue their case once more. Considering that many parks start big coaster projects the summer before they are to open, and in some cases even earlier, the final approval coming in the middle of October for Hercules was frustrating, but at least final approval had been granted. The following Saturday the ride opened to the public, and it was a hit. ACE held their annual conference at the park that June, where the ride received plenty more rave reviews. Even though Hercules was open, the drama did continue. 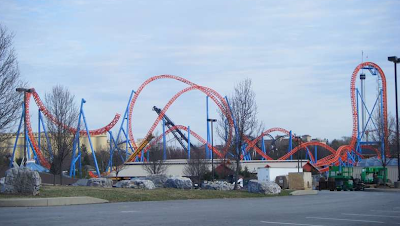 Dorney Park got into quite the squabble with Six Flags Over Texas about who had the biggest wooden coaster, and the noise issues stemming from the ride lasted for years. 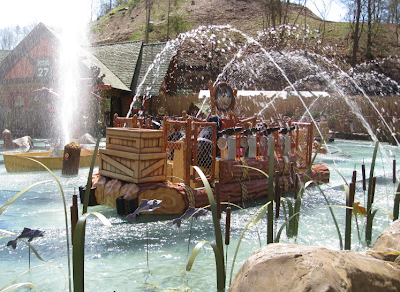 The ride was modified several times after its opening state. Actually, the top of the "triple-up" was lowered a few feet before the public opening to keep the train going as the ride broke in. The real changes came when Cedar Fair purchased the park in 1992. 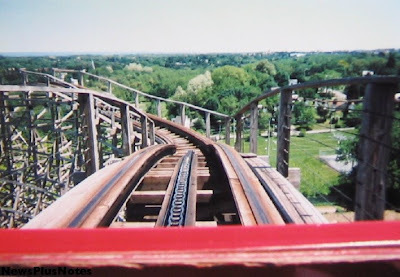 By 1993 trim brakes were added to the ride's first drop, which itself was reprofiled some, heavy work was done to the lake turn, the "triple-up" was lowered significantly, and new trains were purchased for the ride. The coaster needed work several times more; RCCA did some work, Martin & Vleminckx took a turn, and I've even heard that Great Coasters International tried to help Hercules. The above comparison shot really shows the changes made to the "triple-up" hill. On the left is the original hill, the right the lowered version. You can see that we're not talking a difference of a few feet here, it was rather substantial. You can, and could until the ride was removed, see were the old hill was 'attached' to the lift hill supports; that's clearly visible in the above photos. Sadly, over the years the ride got so rough that it's popularity sank. Everyone looked back to the "first four years," meaning 1989-1992 - as the best time to have ridden Hercules. By the time the new millennium rolled around, ridership was low and the ride was still painfully rough. 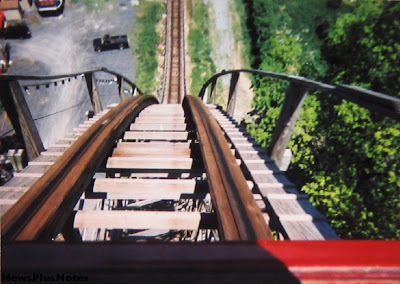 Though the ride was no longer popular, it's enormous yearly maintenance budget was really the final nail in its coffin. Early September 2003 the news broke: Hercules was being removed for a new floorless coaster to debut in 2005. 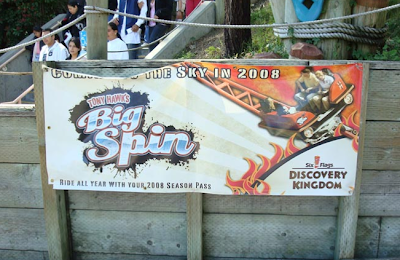 The ride did not open that fall and would be removed shortly after the park closed for the season. Well, the rest of this story we all know - Hydra the Revenge opened in 2005 using most of the space that Hercules did. Perhaps that plot of land is cursed or something, though, as Hydra has never really been the hit the park intended. In all, Hercules gave 15 seasons of wild rides to those who decided to take a spin. Some people loved it, some hated it, but it's easy to agree that the ride's impact on Dorney Park & Wildwater Kingdom lives on today. Oh and hey, if you enjoyed this article or anything you see on NewsPlusNotes - please feel free to thank me through that Paypal or Amazon box in the margin there. I appreciate it! User pufferfish on the Theme Park Review boards has posted a photo report from Carowinds' opening day of the 2008 season. It doesn't look like the park was quite as prepared with new signs and such as California's Great America was. As you can see above Nighthawk has a new sign up, but Drop Tower and Afterburn do not. 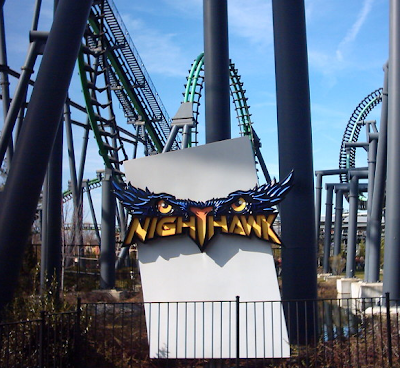 Also, the Borg theming was removed from Nighthawk - that big orb is there no more. Still, from the pictures it looks like the park had a decent crowd and the weather certainly looked nice... go check out all the photos! The Morning Call had an article about The Haunt at Dorney Park today. There's some good details in there about the new stuff that's coming to the park. There's also some stuff that doesn't make sense, like how Club Blood's entrance will be at White Water Landing's exit and that's a move to help spread out the Halloween attractions and crowds. Unless it's just me that area of the park was very crowded in past years. Doctor Doom, and the Cedar Freak Cannonball were right there, and the midway toward Thunder Canyon was busy because of trick-or-treat street. Then again if Cedar Freak Cannonball isn't coming back then that'll free up some midway space I suppose. The application by Cedar Fair, L.P. to further develop the property known as “Dorney Park/Wildwater Kingdom”, located at 3830 Dorney Park Road. The plan proposes to remove a portion of a concrete and gravel maintenance area and partial removal of a landscaping berm along the midway and the installation of a one-story, 3,200-square foot “Haunted House”, queuing area and landscaping. The project area would affect approximately 0.9648 acres of the 187-acre property. The subject properties are zoned CR Commercial Recreation. Sounds just like the pre-fab buildings that went into some of the other Cedar Fair parks late last summer for their new Haunts. Sounds great! The new residents of Busch Gardens Africa's new Jungala area of the park have been moving into their new habitats recently. 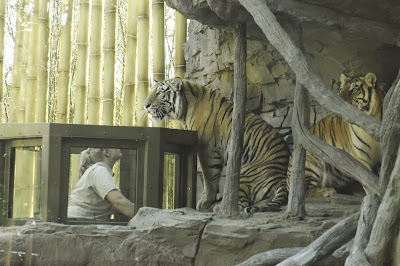 Seen above, the area's Tigers are in their new home, and that viewing box is pretty cool if you ask me. The Jungala area of the park is scheduled to open April 5th. Phew. That's good. Judging from the above logo, it seems that Universal intends for the new coaster to mostly just go by the name "Rockit." Which is good! It's a nice play on the word rocket, it's catchy, and not seven syllables long like the full name. Hard statistics are not really available, but we do know it'll be 167 ft. high and is being built by Maurer Sohne. The ride, positioned between Jimmy Neutron and the Blue Man theater, will use "high-energy video displays in the waiting line; high-intensity, color-changing LED lighting and digital audio and video effects during the ride; and various engineering innovations." The ride looks to have inversions, and will also travel out into the CityWalk area at one point. This is sure to change the 'feel' of the Universal Studios park, but I think in a good way. Hopefully more details will leak out soon! Here's the official press release as well. 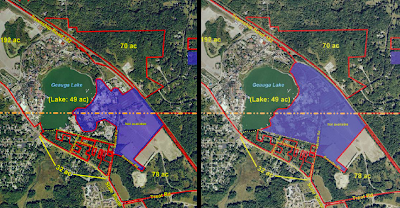 Colliers Int., the company handling the Geauga Lake land sale, has put out a new flyer for the property, and there are some slight differences from the original one. The time period for submitting bids has been extended to May 23rd, instead of the end of this month as previously announced. To me, that means they haven't had much in the way of bidding going on. 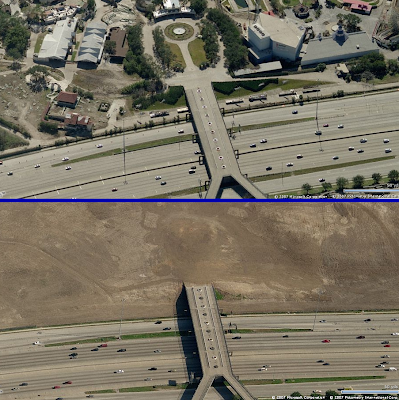 If you look at the image above, the left map is from the original brochure. The right, is from the current one. You can see that they flushed out the area of land that is not for sale, now including all the way up to Raging Wolf Bobs, and extending the area to include the rest of the former Sea World property at the other end. Perhaps this is just a clarification, or perhaps Cedar Fair decided to keep more land ... I'm not sure which. You can find links to the pdf. files that these images come from through this link. Also, Norton Auctioneers has listed Geauga Lake as a location for one of their auctions in June. That means that anything left at the site will be for sale by auction, not just rides but objects for scrap and really anything laying around that's worth anything - at least that's how it's gone at other closed parks, such as AstroWorld. Six Flags has announced that they will have an official Cheerleading Squad for the company this summer, the Six Flags Thrilleaders. No, this is not a joke. That's what I first thought, anyway. The professional squad will travel to Six Flags parks as "Ambassadors of Thrill," as well as perform at charity and corporate events. What a weird idea! I guess it could work though ... reminds me of Thrillville a lot though ... me mashing all the buttons to make that cheerleader cheer correctly to a Miley Cirus song. Regardless, if you want to be a Thrilleader you can try out in New York City in mid April. 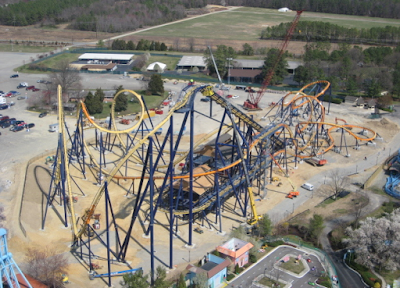 If you head over to CoasterCrew you can check out a bunch of new photos of the Dominator construction at Kings Dominion as well as a podcast video update. 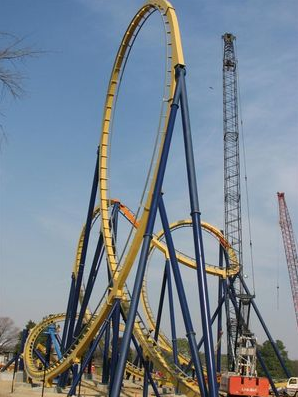 It looks like they're up to the mid-course brakes, which means the loop and cobra roll are in. They've got most of the supports painted, and some track pieces are now a bright orange color. It also looks like they've built a new station for the ride, or maybe it's just the same one but uncovered from how it was at Geauga Lake. CoasterCrew also has pictures of some other changes in the park like the removal of Hypersonic - which is now totally gone from the park. Here's a link to a photo trip report over on Theme Park Review from user CoasterFreak24 that's from Hard Rock Park's VIP Tour preview thing they have going on. The park looks really great! Also, as of yesterday Midnight Rider (the Vekoma Mine Train coaster) has been renamed Eagles Life in the Fast Lane. The Eagles will be providing the soundtrack for this coaster, but sorry, I think that's a silly name. Why not Midnight Rider: Life in the Fast Lane or something. Here's another photo gallery from California's Great America's opening weekend. These photos are really great - great high quality shots showing great detail and wonderful colors, hats off to the photographer. You'll have to head to Steven's Flickr gallery to see the high res version, but the picture above shows plenty of interesting work going on at Firefall. I can't wait to see the finished product. The Haunt at ValleyScare will be expanding again this fall, and there's a twist! Within the depths of the slaughterhouse, innocent mortals will witness a gruesome massacre as murderous butchers and maniacal plant workers lacerate the tender flesh of their human victims. “Slice and dice” will take on a whole new meaning inside this brutal meatpacking plant. Pretty cool. The best part is, they're having a contest to name this new attraction. 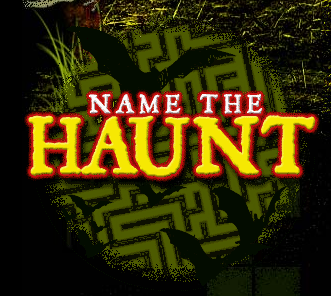 The winner will receive admission and food tickets to the scare's opening night, as well as front of the line passes. User coastrfreak2000 has posted some really awesome close up photos of the Behemoth trains running the track at Canada's Wonderland. I like the trains! They're really long looking because of the seating arrangement, but they're nice and open. Click here to go check out the pictures. California's Great America opened for its 2008 season yesterday. I was anxious to see photos of the park, with the name changes and all. There's a photo trip report over on Theme Park Review that has some photos, like the one above. I actually like the Flight Deck logo, but the sign for Drop Tower is bad and looks flimsy IMO. Firefall looks like it has quite a bit of work left to go before it can open. 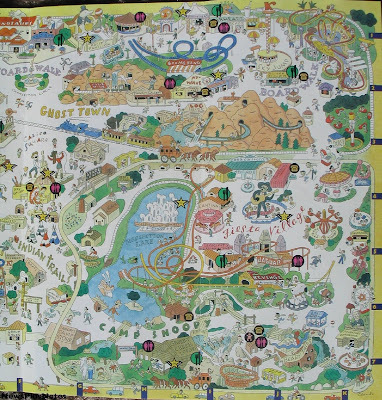 Kings Dominion's 2008 Park Map has been Cedar Fairized! It's not bad though, but would it have been horrible to have drawn in a tree or two? Drop Zone is listed as Drop Tower, Backlot Stunt Coaster and Crypt are there, Bubba's is Outer Hanks, Dominator looks good, Hypersonic is gone baby gone, and Happy Day is the Juke Box Diner. 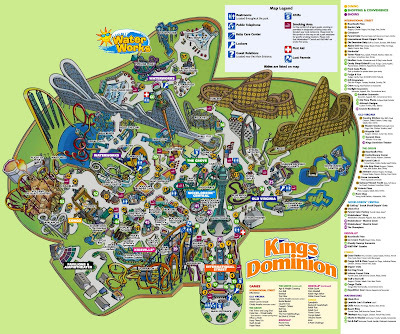 Kings Dominion opens this coming Saturday. Oh, and California's Great America opened today, anyone got a photo report?